30 November -0001 - Forbidden Broadway Review: The Stagiest show in town! Forbidden Broadway is the hilarious theatrical parody show that pokes loving fun at big theatre productions. Having run off Broadway time after time since its birth in 1982, Forbidden Broadway is constantly being revived and reworked to reflect current works. 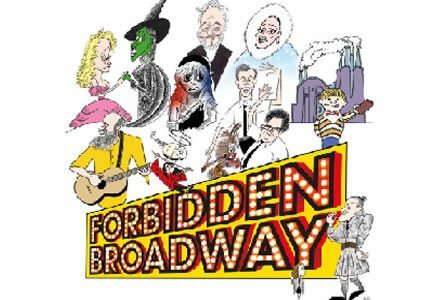 Having been a roaring success in its second turn at the Menier Chocolate Factory, Forbidden Broadway transfers to London’s Vaudeville Theatre from September to November 2014, marking its official West End debut. This addition of Forbidden Broadway spoofs popular shows Once, Jersey Boys, Charlie and the Chocolate Factory, Wicked, Les Miserables, Phantom of the Opera, The Book of Mormon, The Lion King and more! The show is structured in a revue style, with different numbers from popular shows being performed to the same show stopping tunes but with whimsically adapted lyrics and delightfully silly satirical performances. For example we see Trey Parker and Matt Stone mocked to the tune of The Book of Mormon’s “I Believe” and a performance by Liza Minnelli as she belts out her one note in a fabulously sparkly outfit. This show is rather niche and mainly appeals to true musical theatre geeks! Regular theatre goers who have seen a number of poplar West End or Broadway shows will love the show for it’s in jokes and playful romp through the current catalogue of musicals. Whilst those who have seen less show may not understand all of the jokes made on stage, they should still enjoy the show for its playful and uplifting nature. Forbidden Broadway carries a few cheeky innuendos, although these may go over the heads of a few smaller audience members. The show is funniest when the audience members have seen a lot of shows, so small children who have not seen many musicals may not really understand the production. I would say this show is harmless for children over the age of 10 who are accompanied by an adult.